It’s not only sensible, but also sleeker, smarter and less expensive. Battery electric car sales are low and growing more slowly than the Sierra snowpack. Even in green California, and despite a 30 percent increase over 2016, sales of battery electric vehicles accounted for only 2.5 percent of all sales in the state last year, according to the California New Car Dealers Assn. The Nissan Leaf was the earliest practical BEV on the road, and was a landmark vehicle when it debuted on American highways in late 2010. More than 300,000 of the little electric cars have been sold since, about half of them in the U.S., making the Leaf, by Nissan’s reckoning, the top-selling global BEV of all time. But the Leaf has gained company and lost market share since 2010. Nissan said it sold 11,230 of them last year. According to the California dealers group, fewer Leafs were sold in the state in 2017 than the Chevy Bolt EV, Tesla Model S and Model X, and Fiat 500e. Before you start cracking wise about Nissan needing to turn over a new Leaf, the 2018 actually is a new Leaf. The new model goes farther on a charge, recharges faster, has more features, is better looking and costs less than the 2017. The Leaf profile is lower, longer and sleeker. With sportier edges, it looks more like a car and less like a science experiment than previous models. Range has risen to an EPA-approved 151 miles, up from 107 miles, powered by a 40-kWh lithium-ion battery, replacing the 30-kWh battery on earlier models. That, and some software changes have made the Leaf livelier. Horsepower and torque numbers are up substantially on the 2018 model, which jets silently from corner to corner and up to freeway speed. 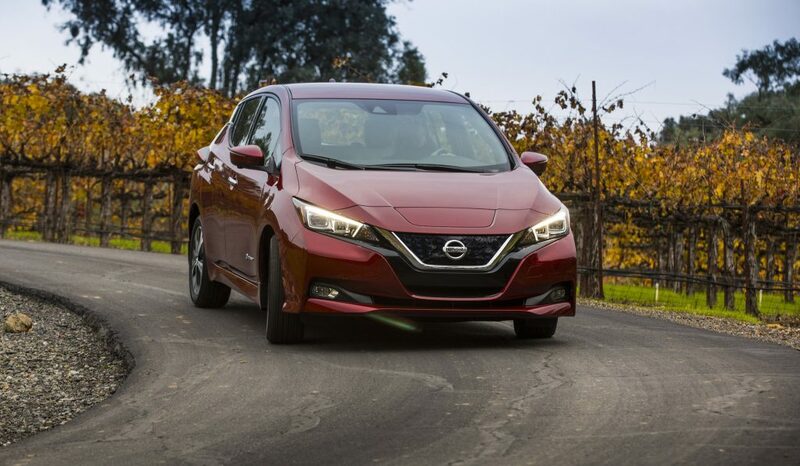 The range and battery life can also be extended using a variety of driving modes, giving the driver more control over how the Leaf’s battery power is spent. A 6.6-kW onboard charger makes it possible to juice the Leaf up more quickly than previous models. Nissan says the Leaf can be charged at the rate of 22 miles of range per hour on a Level 2 charger, or as fast as 90 miles in a half-hour at a fast-charging station. Among the standard new features is Nissan’s e-Pedal, a technology that allows the car to apply electronic “braking” when the driver reduces pressure on the accelerator. This slows the car, and will bring it to a complete stop, while returning energy to the battery. With practice, the actual brakes seldom need to be applied at all – which increases range and extends the life of the brakes. Nissan is proud of its ProPilot driving assistance feature, which is now available in the Leaf. The program is designed to function as an adaptive cruise control system, applying braking and accelerating as needed, and helping the driver steer straight too. The feature is not an autonomous driving system but is a “hands-on” driver assistance tool, Nissan says, designed to reduce fatigue and stress by liberating the driver from constant use of the brake and accelerator pedals. ProPilot was first introduced in Nissan’s Rogue – which aside from the Leaf is the only Nissan vehicle to feature the system – and I had a chance to try it in that vehicle. I wasn’t all that impressed, and looked forward to trying it again, thinking I might have been too critical in my Rogue review. It turns out, though there is a lot to like in the new Leaf, I still wasn’t crazy about the ProPilot, which I found clumsy and lacking in finesse compared with similar systems on vehicles – admittedly more expensive ones – made by Mercedes, Tesla, Cadillac and others. Nissan has given its Leaf a clean new dashboard look and has used fabric and plastics to produce effective sound deadening. Around town and on the freeway, the Leaf is a nice, quiet car. The driver’s cockpit is comfortable and spacious, though the back seats will be a little cramped for full-size adults. Those back-seat folks are given cup holders but no plug-in ports for their devices. The storage area behind the front seats is adequate, and gets bigger when the rear seats are folded forward. But as on a lot of BEVs, there’s a battery back there, which will make loading a bicycle or large box a little difficult. The entry-level Leaf starts at $30,875. The car comes in S, SV and SL trim lines. The model I drove was an SV, which differed from the entry-level S by having a navigation system and Apple CarPlay. Leaf also makes a very subtle backup noise, like a quiet version of the backup beep on a commercial delivery truck. Pedestrians who complain about the stealthy silence of BEVs will benefit from this gentle warning. Will all of that be enough to reverse the Leaf’s sales slide, or get more people revved for BEV driving? It should. Irrespective of how people feel about saving the environment with a zero-emission vehicle – personally, I’m for it – or how much people argue about the electricity that drives BEVs _ yes, some of it might come from a coal-fired plant – the Leaf is a car bargain. And even more so now. On the SV, the MSRP is about $1,700 lower than on the 2017 – $33,375 vs. $35,085. Many state and federal jurisdictions offer rebates and tax incentives to BEV buyers. As a further inducement, EPA tests determined that the average Leaf driver will spend only $600 a year on fuel, and will save $3,750 in fuel costs over five years of driving – and that’s if gasoline prices remain stable. That, paired with the reasonably low MSRP on the Leaf, should help a few people become a little more willing to think about giving up their petrol habit and going electric.